My relationship with Samsung's Note line of products has been fraught since day one. I dismissed the original Galaxy Note phone (or phablet depending on how much you hate the English language) for performing so poorly with its killer feature - the stylus. With the Galaxy Note 2, Samsung has stepped up its game considerably. The phone is still a size that will put many off, but if you can get past that the Note 2 is a terrific device for business users. The Note 2 looks and feels like a larger Galaxy S III. It's a big unit, around 8cm wide and 15cm in length. It'll still fit in your pocket, but just barely. Its body is mostly plastic, and designed by Samsung to mimic a polished riverstone (which is apparently a desirable trait). I prefer the clean lines and professional design of the Galaxy S II, but if its recent devices are anything to go by, Samsung seems content to create phones that look like wet soap. The rounded edges make for a very comfortable hold, that is if your hands are large enough to grasp the device fully. For those with smaller digits the phone can easily be held like you would a tablet but this makes texting a bit more difficult. Considering its size, the Galaxy Note 2 is light. At 183 grams it wouldn't be unreasonable to hold the device for long periods of time, which is great if you plan on taking advantage of the large screen for reading ebooks. The plastic used in its construction is sturdy, and I didn't notice any creaking with the removable back lid which houses the battery and memory expansion slot (micro-SD). The bottom of the device features a standard micro-USB charging port, next to which is the recessed cradle for the S-Pen stylus. 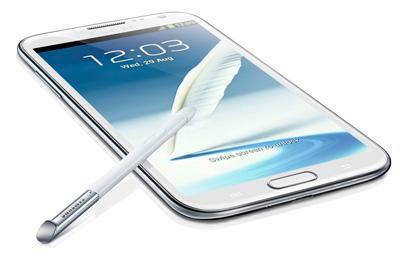 What makes the Note 2 most desirable is its Super AMOLED 5.5-inch screen, just slightly larger than the 5.3-inch previous model. The 720 by 1280 pixel display means most websites will fully display on the screen. Fonts and small details are rendered incredibly well, and I found myself reading ebooks on the device which is something I wouldn't do on my iPhone or most other phones. The resolution also allows high definition videos to be played, whether that's from side loaded movies using the micro-SD slot or HD videos on YouTube. With the previous Galaxy Note phone I was unhappy with the performance of the stylus, but the improvement in usability with the Note 2 is noticable. Firstly the new S-Pen has a bit more girth to it, which makes it more comfortable to hold and write with, and gives you a flat surface to rest your index finger on. The S-Pen features a right-click type button which lets you lasso, crop, and cut images - depending on the context of the app you're in. The Note 2 uses Wacom's digitiser technology, like the previous Note, but the accuracy of writing seems to have improved. The time between making a stroke and having it register on the screen is smaller. It's still noticeable and no where near as polished as using a graphics tablet with your desktop, but a vast improvement over the Galaxy Note. I found myself using the note taking function and pre-loaded app S-Note on several occasions where I didn’t have my pad and pen with me. The ability to add audio recordings to the notes makes this a great tool to take into a meeting. The Note 2 runs Android 4.1.1 (Jelly Bean). With a beastly quad-core 1.6 GHz processor it seemed there was no app which could trip up the Note 2 during my review. Several image editing apps and small movie editing apps were tried, and I didn't notice any slowing down in my time using it. Multitasking is a limited experience on most phones, but features like Pop Up and Play which lets you run videos onto of other running apps, worked well and made the most of the large screen. Once again Samsung has teamed up with cloud locker service Dropbox to provide Note 2 owners with 48 GB of free storage for two years. The Galaxy Note 2 battery performance seems to be on par with contemporary models like the iPhone 5 and the Galaxy S III. A full charge will get you through the business day and into the evening while using texting, Twitter, email syncing, and moderate web browsing on 3G. On average my review device would last 8 hours if I stepped up the 3G browsing, which is similar to the performance of the original Galaxy Note. The Samsung Galaxy Note 2’s large screen and improved stylus which is far from the gimmick it was in the original Note, this is a phone I could easily see myself buying.